NEW ORLEANS (AP) DeMarcus Cousins came to the bench for the final time as the crowd rose to its feet. He exchanged high fives with Pelicans teammates and fans on the baseline, then motioned to the crowd with his raised right hand to keep the adulation coming. If Cousins, Anthony Davis and Jrue Holiday keep playing the way they did against LeBron James’ Cavaliers, there will be plenty more scenes like that. Cousins had 29 points, 12 rebounds and 10 assists, and the Pelicans pulled away for a convincing 123-101 victory over Cleveland on Saturday night. Davis added 30 points, 14 rebounds and three blocks to help New Orleans win for the third time in four games. New Orleans’ All-Star frontcourt tandem had help from the backcourt, too, with Holiday scoring 29 points and E’Twaun Moore 24 as the Pelicans shot better than 53 percent. ”We’re locked in as a unit. We feel like we can battle with the best of them. We’re starting to understand what it takes to win games,” said Cousins, who’s played in only 22 games with Davis since the trade that brought Cousins from Sacramento after last season’s All-Star Game. Cousins mostly scored on powerful inside moves, once dribbling through three converging defenders. He also tossed in the sporadic 3. Davis provided his usual mix of decisive spot-up jumpers and crowd-pleasing dunks, either on the break or crashing the boards for put-backs. Holiday complemented penetrating dribble drives with four 3s. Kevin Love had 26 points and 11 rebounds for the Cavs, who were without Derrick Rose and trailed most of the game. James had 18 points and Dwyane Wade 15 for Cleveland, which has lost three of four. After trailing by 13 at halftime, Cleveland briefly appeared to be taking control with a 21-7 run during which Love hit three 3s, grabbed four rebounds and added an assist. Cousins’ three-point play on a driving layup and Holiday’s 3 were bookends of a 12-2 run that put New Orleans back up by nine, and the Pelicans never trailed again. Love briefly left the game after falling to the floor, clutching his left knee under the basket. 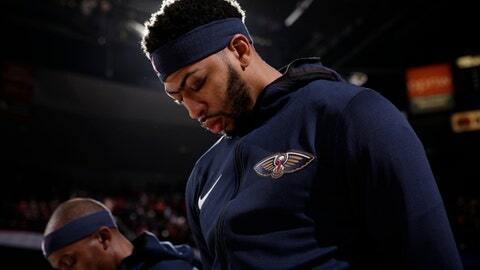 He returned in the fourth quarter, but the Pelicans put the game away with a 13-3 run, capped by Holiday’s fourth 3-pointer, which made it 108-89. ”They’re a tough team to defend,” Love said. Cavaliers: Although Rose previously sounded optimistic that his left ankle sprain would be healed enough to play in New Orleans, coach Tyronn Lue said before the game that Rose was still in pain. ”I don’t know about a setback, but he still had soreness this morning when he tried to warm up,” Lue said. … Lue added that he inserted the 6-foot-5 Iman Shumpert in the starting lineup against New Orleans because he felt that was the best option for defending the 6-4 Holiday. Pelicans: Newly acquired F Josh Smith made his debut late in the first quarter for his first NBA action since the 2015-16 season. He made his only shot and grabbed two rebounds in a little less than seven minutes. … The Pelicans finished 13 of 31 (41.9 percent) from 3-point range. James, Love and Wade all said Cavs are unhappy with their recent play, but aren’t about to overreact after six games. Wade, meanwhile, recalled Miami’s middling start when he and James first became teammates there in the 2010-11 season. Moore, who is starting while New Orleans awaits the recovery of Rajon Rando from a preseason core muscle injury, helped the Pelicans build an early double-digit lead. He hit his first five shots – three of them from 3-point range – and the last of those made it 40-27 early in the second quarter. Wade came off the bench for a second straight game, but didn’t seem to mind. He looked fine after missing one game with a left knee bruise. He drove past Holiday for one, soaring two-handed dunk and also set up a graceful floater with a behind-the-back move. Cavaliers: Host the New York Knicks on Sunday night. Pelicans: Host the Orlando Magic on Monday night.